When it comes to finding the best gaming mouse of 2019, this article is the perfect place to start your search: our guide is been carefully constructed to help you find the perfect gaming mouse for you, with a wide variety of the very best gaming mice on the market picked to cover most price points, styles, and types of usage. Whether you're looking for a top multi-purpose gaming mouse, or a unit that specialises in one genre (like FPS or MOBA), these are the absolute best gaming mice of 2019, so you can be sure that whatever you choose it will be top, top quality. We've literally covered every base with our selection of the best gaming mice, with recommendations for the best wireless gaming mouse, best gaming mouse for cheap, best gaming mouse for FPS, and even the best gaming mouse and keyboard combo. Not only have we presented you with the best gaming mice on the market in 2019, though, but we've also added some context – useful information about what you should look out for when shopping for a quality gaming mouse, plus some savvy buying tips for after you've decided to pull the trigger. Make sure you evaluate what sort of games you tend to play before picking up a new gaming mouse, as certain mechanical rodents specialise in certain genres. There are many factors to consider when buying a gaming mouse. In terms of specs, the big one is DPI (dots per inch), and you should be looking for something in the 8,000-16,000 DPI range. Acceleration and tracking are also important, as is whether the mouse has mechanically switched buttons. Obviously, button quantity is very much worth considering too, as is design and grip type. Remember, there are different ways to grip a mouse – claw, palm, fingertip etc – and you should determine what your grip is before coughing up, because specific mice are primarily designed for specific grips. Also factor in whether the mouse is ambidextrous in design or not, as some are designed for right or left hand users only, as well as if the mouse allows weight alteration. Check if the mouse has any programmable buttons, and which genres it's best for, as certain gaming mice are geared toward first person shooter use and others real-time strategy titles. Lastly, price should be a major factor in which gaming mouse you buy in 2019. Here at T3 we feel you should be able to get a top tier gaming mouse for less than £80, so don't pay more unless you're stretching to added wireless capabilities. The Pulsefire Surge offers a great all-round gaming mouse package at an affordable price point. 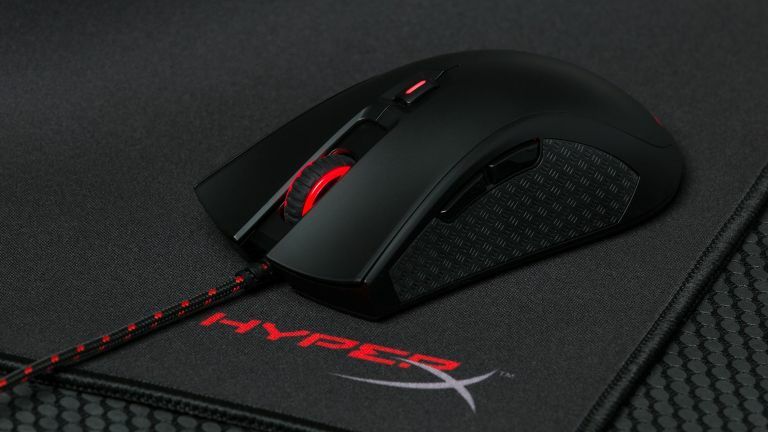 HyperX continues its impressive entry into the high-end gaming peripherals market with this well-specced, RGB lit gaming mouse. The HyperX Pulsefire Surge sports a 16,000 DPI sensor, buttons backed by 50 million click rated Omron switches, on-board memory to store user profiles, and a "Light Ring" lighting system that provides 360-degree RGB effects. All the mouse's settings can be easily tweaked and customised through HyperX's NGenuity software, too. Definitely one of the best gaming mice of 2019. The ROG Spatha is the best gaming mouse in the world for MMORPG gamers. At £130 the ROG Spatha mouse has a serious price tag, but then it's a serious bit of hardware from Asus’s elite Republic of Gamers range, and a worthy choice for our best gaming mouse 2019 list. Made from magnesium alloy and boosting an 8,200 dpi sensor with 2000 Hz polling in wired mode (1000 Hz in wireless), 16 million possibly lighting colours and 12 programmable buttons, it's designed specifically for MMORPG players. It's big and it's heavy, clocking in at a whopping 179g, but it's comfortable in the hand provided you use a palm grip rather than a claw grip. The side buttons are oddly shaped compared to other mice – they’re laid out in the shape of the ROG logo – and take a bit of getting used to, but the odd shape does mean they're easy to identify by touch. Meanwhile the main left and right buttons are independent of the chassis for soft-touch clicks, and you can swap them for heavier switches if you prefer. We're talking a lot of money here, but it's a lot of mouse. If you're serious about MMORPGs it's definitely one for your shortlist along with the Logitech G502. If serious customisation is your bag, then the G502 Proteus Spectrum from Logitech is a gaming mouse that doesn't disappoint. If you are rather picky about the weight of your mouse then you should definitely check out the Logitech G502 Proteus Spectrum – it can be customised with up to six 3.6-gram weights. As such, if you want a heavier mouse to wield on the virtual battlefield then here you are well served. Other nifty features include a free-spinning scroll wheel option (initiated by clicking in a middle mouse button), which makes scrolling a dream, as well as a whopping 11 customisable buttons. And, talking of customisation, Logitech has its own RGB backlighting tech with the traditional 16.8 million colours available to choose from. Undoubtedly one of the best gaming mice of 2019. The Corsair Sabre RGB is lightweight and very accurate, while also ringing in at a very affordable price point. Sitting well below our recommended price for a great gaming mouse, the Corsair Sabre RGB delivers super budget friendly performance. The Sabre's optical sensor is only 10,000 dpi, but it has a super comfortable and light weight design (only 100 grams), and features a 1,000 Hz refresh rate and 8 programmable buttons too. Corsair doesn't skimp on the lighting options either, with its Corsair Utility Engine (CUE) allowing you define the hue and brightness level of multiple lighting zones around the mouse. Overall, a quality gaming mouse for a very attractive price, a worth a place on your best gaming mouse 2019 shortlist. The G.Skill Ripjaws MX780's edgy, futuristic design is unique. Next up is the futuristic looking G.Skill Ripjaws MX780, which is one of the most feature-packed and customisable gaming mice in this rodent roundup. That customisability comes in the form of a height-adjustable palm rest, ambidextrous and interchangeable side grips and, naturally, adjustable weights. In terms of internal tech, the MX780 comes packing an 8,200 dpi laser sensor that supports on-the-fly DPI switching, 8 programmable buttons, on-board memory storage for profiles, and a 1,000 Hz polling rate. And the best thing is that you get all that for a very attractive price. One of the best gaming mice on the market in 2019, and one that rocks a stand-out design. The ROG Gladius II is, simply put, one of the best looking gaming mice on the market today. A curvaceous beauty, the Asus ROG Gladius II gaming mouse is one hell of a looker. It also doesn't skimp on features or hardware, with a very competitive 12,000 dpi sensor, 50g acceleration, and removable left and right buttons in the mix. There's no fancy swappable weight system in the Gladius II, but a clickable scroll wheel, Omron switches, and a sensitivity toggle make this mouse well-suited to a host of genres, and one of our best gaming mouse for 2019 picks. Oh, and if you dig gaming mice that can deliver ridiculous levels of RGB lighting, then the Gladius II will certainly not disappoint, with colours and patterns also capable of being synced across other Asus peripherals, too. If you want a no-frills but quality gaming mouse on a budget then the Sensei 310 is well worth a look. While the SteelSeries Sensei 310 has its shortcomings, such as a lack of weight adjustment and slightly plasticky finish, those sacrifices are there to raise the bar everywhere else. And raise it spectacularly! With its ambidextrous design (suiting both left and right-handed users), super-precise 12,000 dpi sensor, and lightweight build (weighing in at just 92g), it's one of the best gaming mice of 2019 for us – especially when you factor in its very affordable price point. If you're a fan of light, no-frills but high-performing rodent accessories, this could be the best gaming mouse for you. The Roccat Kone AIMO has looks to die for, and fantastic performance, too. Roccat's latest gaming mouse, the Roccat Kone AIMO, is an absolute beast in every sense of the word. Not only is it one of the chunkiest mice on the market, but it also boasts an impressive set of customisable features including Easy-Shift (which gives each of its 12 buttons a second function), five individual profiles, glorious RGB lighting and plenty more besides. A fantastic peripheral, albeit one that's only available in right-hand form. A definite shoo-in on our best gaming mouse 2019 list. The Logitech G903 offers DPI levels from 200 all the way up to 12,000. Logitech has given its venerable G900 gaming mouse design a bit of a makeover, and while those changes are subtle, they simply serve to elevate an already impressive PC peripheral. The Logitech G903 features a "1 ms report rate for competition-level twitch targeting" which basically means next to no latency when playing competitively. It also boasts myriad DPI levels (from 200 all the way up to 12,000) and mechanical buttons for that all-important sense of feedback. Expensive, yes, but worth it if you want one of the best gaming mice of 2019. SteelSeries upgrades the Rival, with impressive gaming mouse results. SteelSeries continues to show it's one of the leading manufacturers in gaming mice with the latest addition to its Rival range – the updated and retooled SteelSeries Rival 600. This new model comes with two optical sensors, one for detecting normal movement, and another for clocking when you lift the mouse off the pad/desk. It features a rubberised grip for extra control and comfort, and a set of mechanical buttons of extra precision. Oh, and it features all the RGB lighting you could wish for in your gaming mouse. The Corsair Dark Core RGB SE is one of the best wireless gaming mice in the world right now. Corsair’s new gaming mouse model aims to break the stigma surrounding the wireless gaming mouse: its use of Qi charging helps fix the long-running latency and response issues that have made non-wired rodents so unpopular in gaming circles. The Corsair Dark Core RGB SE has 1ms latency and a max dpi of 16,000 so you can be sure this wireless beauty won’t let you down in a competitive match. The only caveat is you can't use it while it's charging on a normal Qi charger, so you'll need to invest in a Corsair MM1000 Qi mouse pad in order to use it while it's refilling on power. Corsair's Glaive RGB gaming mouse offers serious levels of customisation. Corsair is really committing to the gaming mouse market, and one of its latest additions – the Glaive RGB – aims to set itself apart with both RGB lighting and a set of interchangeable thumb grips. That element alone makes it one of the most ergonomic designs you can get, but thankfully it makes for a really slick gaming mouse, too. Its tracking system offers 16,000 dpi so you're never going to be left wanting when it comes to response times, while its Omron switches offer 50 million clicks per model. It's a tad pricey, but you get a lot for your money. The Cooler Master MasterMouse MM520 is worth a look at the budget end of the market. Gaming mice can sometimes be a little expensive – especially if you want to get your hands on an eSports ready model or something with all the bells and whistles of the top brands – but that doesn't mean you can't buy quality for an affordable price. The Cooler Master MasterMouse MM520 does just that, with some reliable Omron switches and some respectable specs right out of the box. With 12,000 dpithis should do you for both long sessions in your favourite shooter or strategy title, or double as an everyday mouse for home/work use. And at less than £40, it's a relatively easy investment to make, too. Combining classic looks with modern specs, the Logitech MX518 is just as essential as it was back in 2005. Back in 2005, Logitech launched the MX518 and changed the landscape of gaming mice forever. With a comfortable design perfectly suited for long periods of play and an impressive 1,600dpi (for the time, at least), this powerful little rodent became an instant classic. A good 14 years on and Logitech has revived its old favourite and given it a modern makeover within. With a 16k HERO sensor (with a dpi ranging from 100 to 16,000) and an impressive ARM 32-bit microprocessor - backed up by some additional on-board memory - the new MX518 can support up to five profiles simultaneously so you can flit between them different setups depending on your choice of game. Add in a suite of customisable buttons and that familiar comfortable design and you're onto a serious winner.